'Rock and Roll Star' Sanders Speaks in N.H.
Bernie Sanders hosted a crowd of more than 750 people at Franklin Pierce University in Rindge, New Hampshire, three days before the first-in-the-nation primary. At times, it looked and sounded like your favorite concert. "I feel like a rock and roll star," Bernie Sanders said to the crowd as he took off his jacket. The headliner on Saturday morning was the Vermont senator himself. "Bernie, Bernie, Bernie," the crowd chanted after Sanders tossed them his jacket. Sanders will be on Saturday Night Live in New York City, but the show started early for him in Rindge. "We are going to take on the billionaire class and create a political revolution," he said. Stephanie Scherr of Fitzwilliam has seen a lot of candidates in person, but says not one compares to Sanders. "There is just this feeling in the room that I have not felt at any other event," Scherr said. Sanders plans for tuition-free college and a single-payer health care system have been criticized as radical and unachievable. When asked is she was concerned about Sanders follow-through on his promises, Scherr responded, "no, not at all." But not everyone in the crowd is so convinced. "I'm a little tied between Hillary and Bernie," said New London resident Michael T. Brown. "Hillary has a lot behind her but also Bernie kind of speaks to my generation." Rhode Island high school student Alex Azar was on a class trip to New Hampshire witness the run up to the First in the Nation Primary for themselves. "I am concerned about Bernie Sanders' foreign policy experience, but I am a big fan of his domestic policy," Azar said. Recent polls put Sanders ahead of Clinton by double digits in New Hampshire. In three days, if those polls prove correct, Sanders says he could very well ride that momentum all the way to the white house. "If we can win here, the eyes of the world will know this country is about to move in a new direction," Sanders said. The campus has hosted 10 candidates. 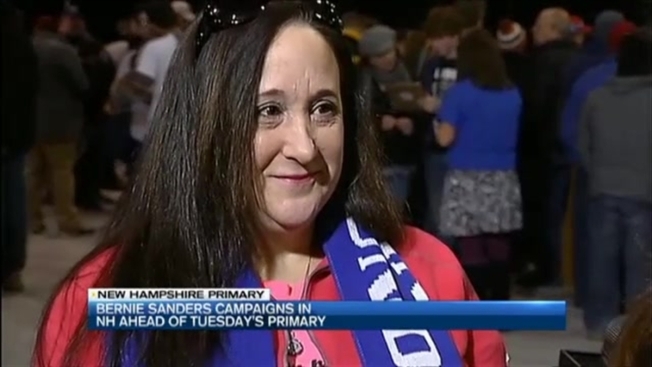 Franklin Pierce Assistant Director of Admissions Bianca Acebon Peco tells necn that Sanders attracted a larger crowd than any other candidate by more than 500 people. Acebon Peco says the school invited Clinton, but that her campaign only offered a surrogate. They say the offer is still on the table and there's three days left.